We were delighted to have received a donation of £1,500 to support our work with young carers. 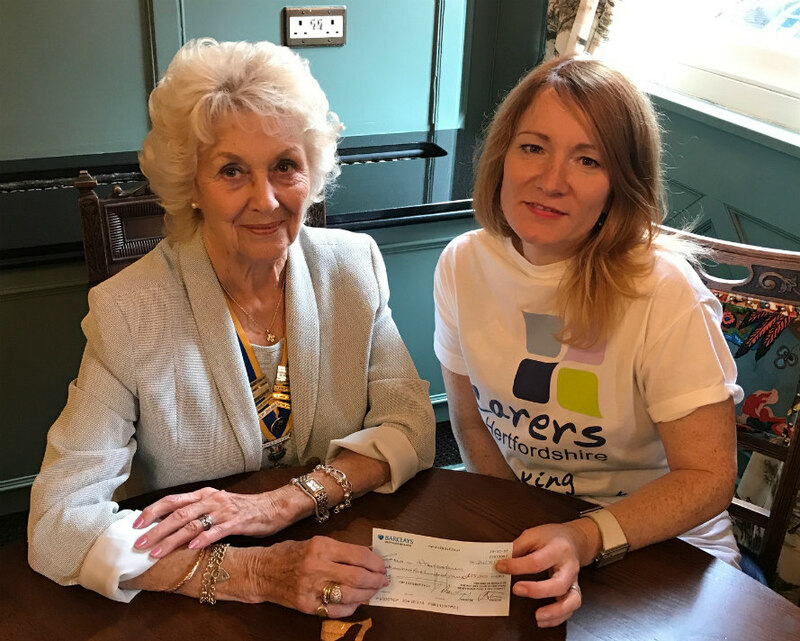 Hertford Rotary Club donated the money, which was raised at this year’s Hertford Carnival, as we were one of the charities chosen to benefit from the profits and donations. 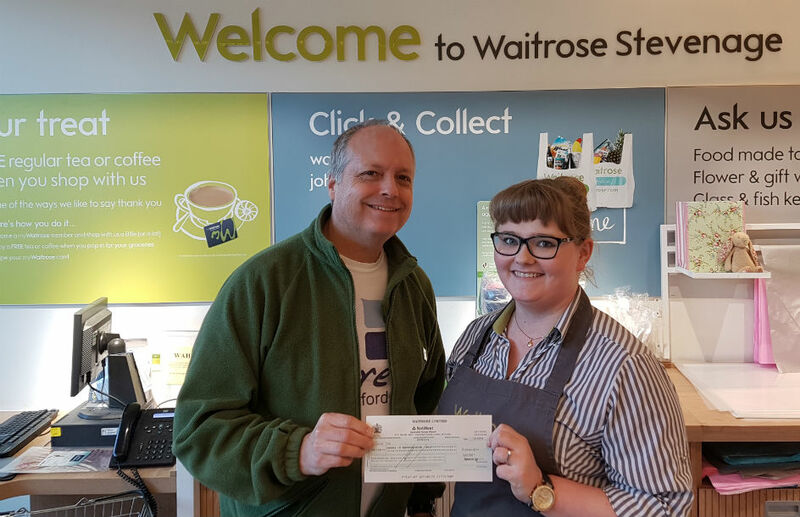 Thank you to staff and customers from two Waitrose storesfor supporting us through the store’s Community Matters scheme. We were delighted to have been chosen as one of the three charities being supported by the Stevenage store in July 2017 and as a result of the green token votes we received from shoppers we have recently received a cheque for £309. David Cadogan, our GP Liaison Worker, dropped into the store recently to collect the cheque. We also received £270 thanks to support from staff and customers at the Northwood store in February 2017. Linda Cudmore our Community Fundraising Lead was presented the donation from Louise Laider, Assistant Section Manager Operations, and Anna-Maria Morris, the Charity Co-Ordinator. 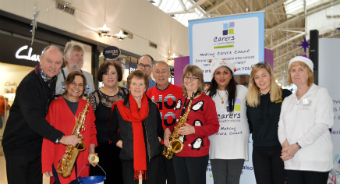 Shoppers at The Galleria, Hatfield, were entertained with live music when we had an information stand and bucket collection at the centre. Roxy Searle, a young adult carer and singer/songwriter, kicked off with a set on December 17th and was followed by the BSV Jazz Band, from St Albans. Both acts put on a great performance and their efforts helped raise over £300 for our work supporting unpaid carers. We would like to thank Reverend Austin Janes and the congregation at the Grovehill Church of the Resurrection for their generous donation of £130. It is really encouraging to see that the church understands and values Carers in Hertfordshire and our work. There are nearly 15,000 carers in the Dacorum District alone, so we have much more work to do in identifying and supporting more of them. We therefore plan to work together with the Church to identify more carers in their local community and congregation. This will ensure they know about all of our free support and advice. The festive spirit was flowing as High Wych Scottish Dancing Club held its Charity Christmas Party at High Wych Memorial Hall, near Sawbridgeworth, on December 6th 2016. 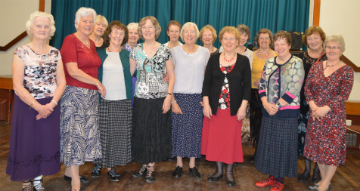 More than 30 people from the club and neighbouring groups in Harlow and Bishop’s Stortford danced the night away.They enjoyed supper together and ran a raffle. Whilst having a lovely evening, they decided they wanted to support the work we do with children in a caring role and we are pleased to have received £100 toward our Young Carers Service! Linda Cudmore, our Fundraising and Development Manager, said: " We are so pleased the High Wych Scottish Dancing Clu thought of our young carers when planning their Christmas Party. It just goes to show that you can have fun and help other at the same time. If you would like to take up Scottish dancing or make friends in the High Wych area please contact Linda Masters at for more information." We would like to send our thanks to a talented supporter and carer who transformed his front garden into a spooky Halloween display and has raised just over £1,700 for our work with young carers. 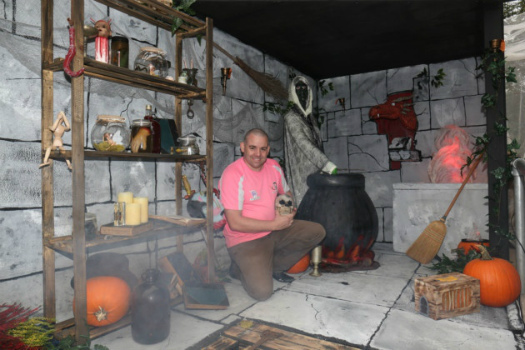 Steve Penstone-Smith and his family spent several weeks creating items for the creepy display at their Hatfield home. It featured a castle centrepiece, witches’ cauldron, dragon head coming out of a wall, skeletons and more. Visitors could look around the display over the Halloween weekend and make a donation. 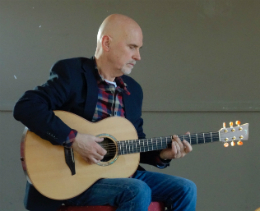 Thanks to local Musician Pat Crilly and The Hertford Club hosting two music events this summer funds to support our work with unpaid carers have been boosted to the tune of £2,000! 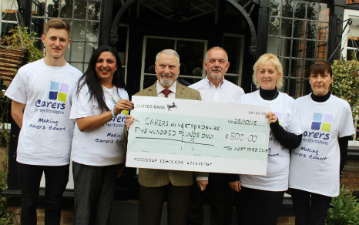 The Hertford Club generously donated £500 from takings at the two events they hosted - K-fest and the Musical Mystery Tour and Pat, who organised and performed at the events, helped raise the rest through collections and raffles. We would like to express our thanks to the staff, children and parents of Heath Mount School for their fantastic fundraising efforts on our behalf over last year. Heath Mount, founded in 1790, is one of the oldest Prep Schools in the country, situated in the Grade 1 listed mansion in the lovely Woodhall Park Estate near Watton at Stone. At the recommendation from one of the parents our Young Carers Service was accepted as the school’s Charity of the Year and Heath Mount has worked hard on our behalf. Following several enjoyable social events for parents and friends came the sold-out black tie Annual Gala Summer Ball in June, held in a spectacular marquee on the school lawns. Elegant guests enjoyed a splendid evening during which a raffle and an auction helped to raise funds on our behalf. 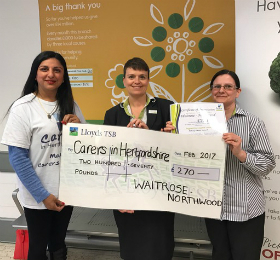 The fund raising efforts of all those at Heath Mount have contributed a magnificent £6,000 which will make an enormous difference to our ability to support Young Carers across Hertfordshire. Not only that, the involvement of the children at Heath Mount will raise their awareness of the work young people are doing in caring for others and this will be of tremendous social benefit to the communities they will grow into as adults. We know how time-consuming work of this kind can be, especially when it is volunteered as Heath Mount School has so admirably shown. 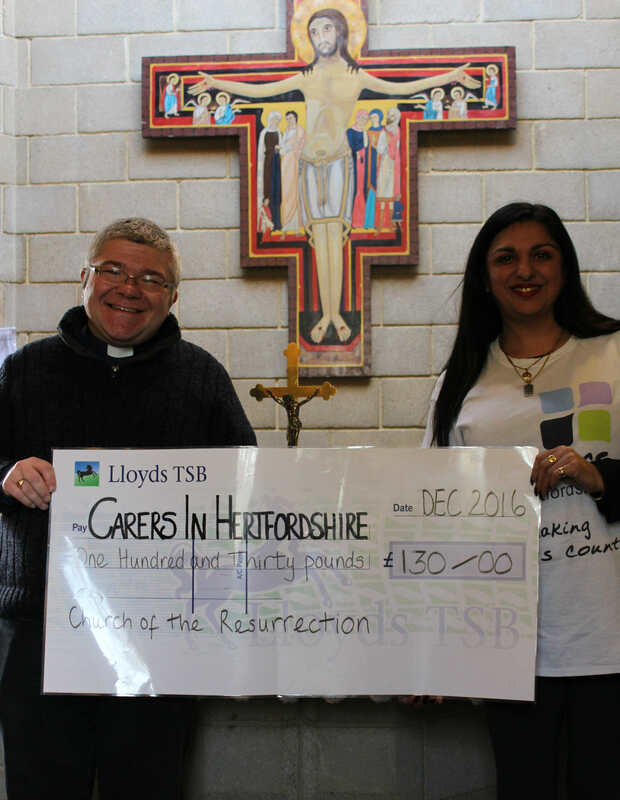 We at Carers in Hertfordshire wish to show our gratitude to them for both the cash they have donated and their generosity of spirit. They are a beacon for others to follow. 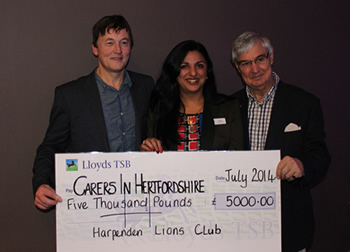 Harpenden Lions Club, which was formed in 1980, organizes and supports charity events and provides practical assistance for residents in the area. It is a part of Lions Clubs International the world’s largest service club organization with 45,000 clubs and more than 1.3 million members. We previously announced that the Harpenden Lions had chosen us as one of the charities supported by their Annual Highland Gathering event last summer. We’re now delighted to announce that this astonishing day resulted in a donation of a cheque for a fantastic £5,000, which was presented at the Lions Club Christmas Dinner. This generosity will help us to focus our energy on reaching out to more hidden and often isolated carers right across Hertfordshire – and our thanks go out once again to everyone involved in arranging the incredible day. 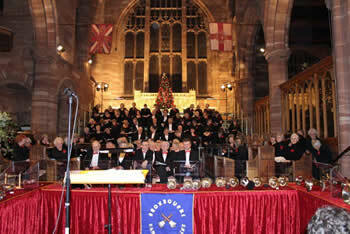 Hertford Choral Society is a friendly community based choir that welcomes all comers who enjoy making music together. This generosity of spirit was reflected in their decision to make us one of the beneficiaries of their Annual Christmas Concert in All Saints Church in Hertford. The choir of 102 singers was joined by the choir of Duncombe School, flutist Sally Quartrille and the delightful Broxbourne Handbell Ringers to provide a joyous feast of seasonal music, raising a super £519 each for Carers in Hertfordshire and The Brain Tumour Charity. Thanks to the Hertford Choral Society’s efforts we can support more of the 109,000 hidden carers across the county. Imagine our delight, then, when their mini-choir organised by David Benson held two Christmas Carol concerts at The Barge and one in the foyer of Hertford Theatre between performances of the Christmas Pantomime. They raised another £68.98! We’d like to thank Hilary Laidler and David Benson for giving so generously of their time in organising the concerts, which raised a most welcome plus £588!! It all adds up to make a BIG difference! ** If you have any fundraising events in aid of Carers in Hertfordshire you would like included on this page, call 01992 58 69 69 or email we would love to hear from you! Don't forget to visit our Corporate Supporters pages too.